Optics Pro 10's results are spectacular, but it's a specialised and sometimes complex tool to use. It's arguably the best raw converter of all, but that's just about all it does. It works by checking the EXIF (shooting) data embedded in the image by the camera, then looks up the combination of camera body and lens in its test database. It's also a raw converter, and DxO has applied just as much scientific rigour to this process as its lens corrections. You can browse the images on your computer, folder by folder, then select an image and choose from the default conversion/correction setting or a range of presets – you get to see how your image will look before you choose. You can also adjust the settings manually. At this point, DxO Optics Pro can get quite technical, especially when you're juggling the Exposure Compensation, Smart Lighting and Selective Tone settings to get the best tonal balance and dynamic range. It's worth it, though, because DxO Optics Pro's raw conversions are quite superb – the difference in detail rendition and noise control compared to Adobe Camera Raw (supplied with Photoshop CC 2014 and built into Lightroom 5) is immediately obvious. DxO makes two other programs – ViewPoint 2.5 and FilmPack – which can now integrate with Optics Pro as plug-ins. 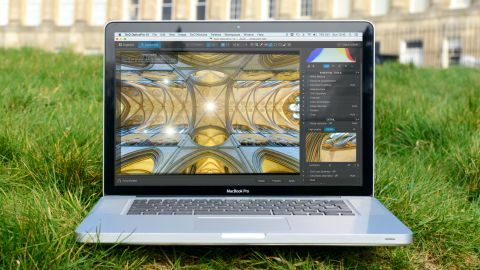 ViewPoint 2.5 works both as a standalone program and as a plug-in – and not just for DxO Optics Pro, but for Photoshop and Lightroom too. When used in conjunction with DxO Optics Pro it appears in its own panel in the tools sidebar and extends Optics Pro's geometric perspective and correction tools. Perhaps its most interesting feature is its Volume Deformation correction – it fixes wideangle distortion at the edges of the frame to restore correct object proportions. This means you can correct converging verticals in architectural shots, but also fix the distortion that makes people's heads (and other objects) look unnaturally elongated at the edge of the frame in wideangle shots. In previous versions of DxO Optics Pro there was considerable crossover between the geometric corrections in Optics Pro and those in ViewPoint. In Optics Pro 10, however, DxO has migrated the geometric (perspective) corrections completely to ViewPoint 2.5. It means paying another £39, however, to get ViewPoint 2.5. It's quite ironic that DxO should go to such lengths to get 'perfect' renditions from cameras and lenses, and then design a program designed to replicate all the flaws, weaknesses and failings of analog film and old cameras. But FilmPack 5 does reproduce film 'looks' really well, whether you're going for a technically correct black and white film rendition or a dreamy, retro colour image. FilmPack 5 costs £39. DxO's FilmPack 5, bought separately, works as a standalone program and a perfectly-integrated Optics Pro 10 plug-in. DxO Optics Pro now integrates directly with DxO's ViewPoint 2.5 and FilmPack 5 programs. ViewPoint 2.5 offers advanced perspective corrections, while FilmPack 5 replicates the look of classic films, darkroom processes and cheap cameras. These three programs work really well together. DxO has also made its PRIME de-noising process faster. The standard noise reduction is impressive enough, but the PRIME process, though slow, can work the most amazing transformations on high ISO images. A new ClearView option applies automatic localised contrast enhancement to improve distant landscape scenes and, according to DxO, the program is 1.5x faster to launch and 10x faster at loading files. The results from DxO Optics Pro are excellent. However, it does lack any image cataloguing tools and localised adjustments, so it would never be your one and only image-editing tool. Note that DxO has changed the configuration of its Standard and Elite packages, too. Previously, the Elite edition was for high-end/pro cameras; now both version handle all cameras, but you need the Elite version for the more advanced tools.